With a dry erase board you could easily write down all of the messages you need. It’s just so bland, some messages need a little more finesse to be properly delivered. 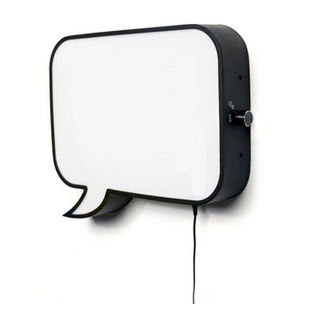 Thankfully there are things such as this speech bubble wall lamp that will be sure to make your messages much more obvious to anyone else in your home. Sure, it’s not really necessary to pay the extra money for a light up chat bubble, but it makes things so much more fun. It akes us wish that we had the amount of cash needed for purchasing this. The lamp can be wall mounted and the front is a whiteboard that can be marked on with your usual whiteboard marker. The frame of the light is actually a steel frame. You can purchase it for £195 or $300 through Northern Lighting.